Apple's stock may seem expensive at more than $500 a share, but it's still a good bargain when you look at its earnings growth. NEW YORK (CNNMoney) -- In case you haven't heard, Apple's stock climbed above $500 a share for the first time ever on Monday. Make no mistake: Apple is still a cheap stock. First things first. The $500 threshold is a meaningless level. If Apple (AAPL, Fortune 500) chose to announce a 10-for-1 stock split today, the price for one share would fall all the way down to $50. Anyone who owned one share at $500 would simply have 10 shares following the split. Would that make Apple more affordable to average investors? Perhaps. But it won't change the market capitalization of the company one iota. That's what investors have to focus on to determine if Apple is a bubble or a bargain -- the valuation of the company as measured by its earnings potential. Analysts currently expect Apple to report a profit of $42.59 per share for this fiscal year, which ends in September. At the current price of about $504, that works out to less than 12 times earnings estimates. To put that in perspective, the S&P 500 is trading at 14 times profit forecasts for 2012. Earnings for the broader market are expected to grow at a much slower rate than Apple's profits. Apple is even more appealing when you consider that it has $97.6 billion in cash and securities on its balance sheet. If you subtract that from the company's overall market value of about $469 billion, investors are putting a price of about $399 a share on the "core" (sorry, that pun never gets old) business. This means that Apple's actual operations are trading at only about 9 times fiscal 2012 earnings estimates. Nine! You know what kind of companies trade at single-digit P/E ratios? Growth-challenged techs like HP (HPQ, Fortune 500) and BlackBerry maker Research in Motion (RIMM). And stodgy automakers like GM (GM, Fortune 500) and Ford (F, Fortune 500). Simply put, Apple's meteoric stock price rise is justified as long as the company continues to deliver solid sales and earnings. 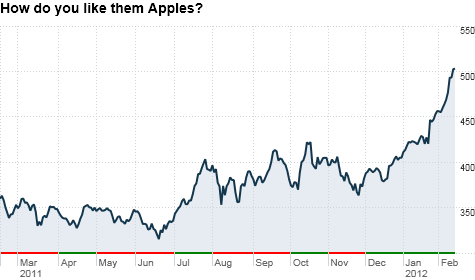 Investors are catching on -- Apple's stock is up 30% during the past three months. But analysts' consensus earnings estimates for 2012 and 2013 have risen by more than 20% during the same timeframe. So if you want to be a contrarian and bet that Apple stock will soon go down, you need to assume that earnings estimates are too high. For that to be the case, one or more of several unlikely events need to occur. Europe will lead to a global recession that kills consumer spending. That actually may happen. But if Apple survived and thrived during the dark days of 2008 and 2009, I find it hard to believe Greece will dent demand for iEverything. Consider this. Gross domestic product in the U.S. plunged at an 8.9% annualized rate in the fourth quarter of 2008 -- the worst of the Great Recession. During those three brutal months, Apple still posted modest sales and earnings increases. Revenue and profit even hit new quarterly records. Tim Cook will waste money on a big acquisition. I seriously doubt that new CEO Cook is going to forget everything that Steve Jobs taught him. The beauty of Apple is that its growth, by and large, has always been organic. Apple has never needed to spend big bucks on mergers. As long as Apple steers clear of a splashy deal, then the risk of Apple falling on its face due to integration issues -- something that's tripped up Cisco (CSCO, Fortune 500), HP and other acquisition-happy big tech companies in the past -- is non-existent. Apple's products will start to stink. Strangely enough, that could be the biggest risk. Apple is on a phenomenal winning streak. Consumers love their iPhones and iPads. But as Steve Jobs-founded Pixar recently proved with the lackluster box office numbers and abysmal critical reviews for "Cars 2," no company can bat 1.000 (spring training starts soon!) forever. What happens if the iPad 3 isn't as well-received as its predecessors? It's worth asking the question, but I doubt that investors have much to fear. 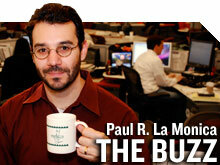 Remember the lukewarm reviews for the iPhone 4S last October? Many were unimpressed simply because it wasn't the iPhone 5. Well, the iPhone 4S was the top-selling smartphone last year. AT&T (T, Fortune 500), Verizon (VZ, Fortune 500) and Sprint (S, Fortune 500) are even willing to tolerate smaller profit margins (or in Sprint's case, bigger losses) to be part of the cool kid Apple carrier club. Cannibalization? The iPod is essentially a dying business within Apple thanks to the success of the iPhone. Will the same thing happen with the Mac due to the iPad? I don't think that's likely anytime soon. There are still plenty of things that people need to do on "computing devices" that are not easily accomplished on a mobile gadget. But it begs the question: What's next at Apple? What will be the new iWonder? Is it a TV or other home entertainment device? Is it something more software-focused? Perhaps something nobody can even imagine yet? Apple clearly needs to keep innovating. I think it will do that even without Steve Jobs. But the loss of Apple's creative spark could be a problem. Foxconn backlash. This is the least likely scenario. The stories of poor labor practices at Foxconn and other tech suppliers in China are gut-wrenching to read. Apple and other big companies need to do more to make sure workers in emerging markets are treated humanely and compensated fairly. Despite the recent protests at Apple stores, the issue probably won't make a dent in sales. At risk of being callous, there is little evidence that consumers will stop buying a product from a company even if there are well-documented labor problems. Nike (NKE, Fortune 500), Wal-Mart (WMT, Fortune 500) and Ralph Lauren (RL, Fortune 500) have been criticized for alleged "sweatshop" practices abroad. Like Apple, all three stocks are near their all-time highs. Best of StockTwits: Earnings "season" is winding down. But there are still some companies that traders love reporting results. Rackspace (RAX) and Michael Kors (KORS) wowed. Zipcar (ZIP)? Not so much. VMware (VMW) is obviously a great company too. But I am really impressed with Rackspace. I have interviewed CEO Lanham Napier several times and he comes across as incredibly charismatic but in an authentic way. It's no wonder it is one of Fortune's Best Companies to Work For. The mistake people often make when talking about consumer spending being good or bad is that there are always winners and losers in retail regardless of the economy. Like Ralph Lauren, Michael Kors, which has now more than doubled since its IPO, is clearly a winner. If this keeps up, they may need to award contestants on the next season of "Project Runway" shares in KORS. PeteO: I love $ZIP car use it all the time, but lucky I didn't buy their stock today. Stinks that they missed. It really is a great service. My wife and I used Zipcar before we bought a car and loved it too. But I never understood how ZIP made money. At the end of the day, profitability trumps customer experience for investors. Of course, it's nice to have both. Like Apple.